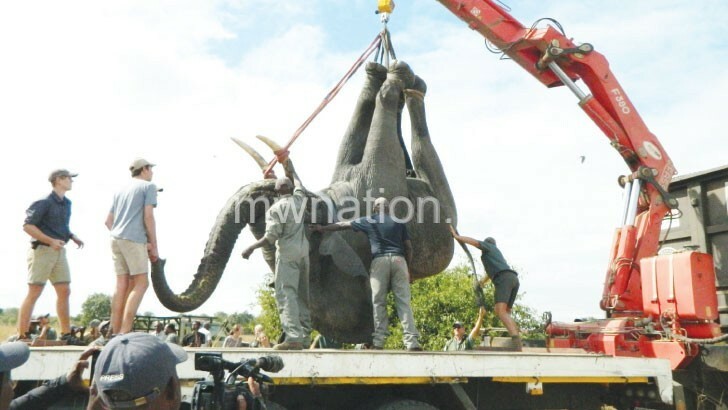 When teachers at Chitenje and Kaombe primary schools heard that two elephants had strayed out of Nkhotakota Wildlife Reserve last October, they suspended classes instantly. The ripples of fear were far-reaching as farmers in Chitenje, three kilometres from the protected area, abandoned their crop fields for fear of being trampled by the massive mammals on the prowl. After all, just weeks earlier, another nomadic elephant had killed a woman who was fetching firewood in the natural forests between the wildlife reserve and villages in Chitenje. Human-wildlife conflicts pose a threat to Nkhotakota Wildlife Reserve which received 500 elephants from Liwonde National Park and Majete in the world’s largest translocation of the giant mammals. At the centre of the conflict is poaching, felling of trees and farming close to wildlife sanctuaries that attract tourists. The elephants escaped from the protected areas due to farming activities which have depleted their habitat and food,” said Stanley Mataka, from the affected area. Thankfully, says park manager Samuel Kamoto, the elephant did not harm anyone. However, some have crashed human beings and crops in their way. Last August, game rangers were forced to kill an elephant that had killed three people within 24 hours in Dowa and Ntchisi. In Katuli, Mangochi, some 2 000 families still count themselves lucky that there were no fatalities last month when stray elephants raided their village. The massive mammals wiped out 600 hectares of crops, leaving families homeless, poorer and on the verge of hunger. Such are the fierce battles between human beings and wild animals that some communities gang up to kill them while others blame government of protecting wildlife at the expense of people. This feeling is pronounced in Nsanje North, where people killed a stray buffalo last June. Shire Valley Parks division manager Alick Makanjira faulted the community members for taking the law in their hands instead of summoning game rangers to scare it back to Mwabvi Game Reserve, but group village head Mpangira claimed they slaughtered it “to protect their lives and property”. However, the rural community in Traditional Authority Malema had a shock when the police swooped on two men-Ruo Khambadza, 24, and Jailosi Fungulani, 48- for illegal possession of meat of the wild animal they had taken down. No less taken aback are people in Rumphi where footprints of a lion believed to have bolted from Vwaza Marsh were spotted in Mphompha, Uzumara, Phoka and Phwezi last week. Chief Mwalweni wants a quick end to the disruption caused by the lion. “We are told that the rangers can’t kill the lion, but dart it back to the game reserve. We improve them to consider peoples’ plight as well. We are in danger in the name of wildlife conservation,” he says. However, Timothy Chana, parks and wildlife division manager in the Central Region, says animals usually escape when people vandalise perimeter fences and encroach wildlife reserves. Chana says the crop fields on the boundaries of wildlife reserves woo animals, especially grazers. “These animals have a very strong sense of smell. So, cultivating along the parks attracts elephants to continue destroying their crops,” he says. The wildlife expert urges locals to take ownership and stop vandalising electric fences that repel animals. “The most reliable option to prevent human-animal conflicts is strong fences. So, communities need to take care of the fences,” he says. In Kasungu, some communities have delved into beekeeping because bees are known to repel elephants. In communities surrounding Nyika National Parks, parks and wildlife officials encourage communities to cultivate pepper and other crops elephants do not eat. According to Department of National Parks and Wildlife director Brighton Kumchedwa, human-wildlife conflicts often occur when fields have crops. He states: “We have measures to address the problem. For example, some parks like Nkhotakota Wildlife Reserves and Liwonde National Park are being fenced to prevent and minimise that conflict.